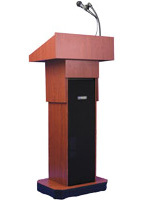 This 50W adjustable column lectern w/wired mic features pneumatic height control, a built-in sound system with speakers and gooseneck microphone, and a rolling design for portability. 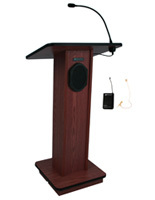 The red mahogany finish wood laminate presentation stand has a 24" wide slanting top with book stop for holding books, notes or tablets. 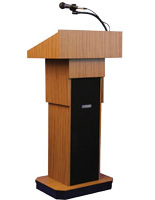 Each portable 50W adjustable column lectern w/wired mic has four hidden caster wheels, two of which lock for stability during use. 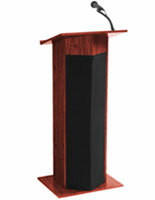 The built in sound system makes this versatile presentation pulpit a great choice for use in auditoriums, conference halls, boardrooms and meetings as well as in places of worship. 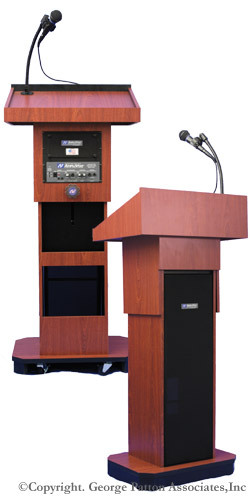 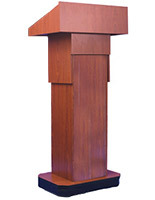 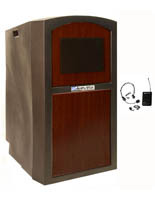 The rolling presentation lectern w/wired mic comes built in speakers as well as input and output jacks for external speakers, wireless microphones, recording and projecting systems. 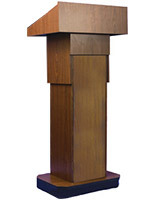 This portable pulpit's crowd-friendly design and stylish, elegant looks make it a superior, economical choice for any business or institution.